According to CBP, exam topics typically include: Entry; Classification; Trade Agreements; Valuation; Broker Compliance; Power of Attorney; Marking; Drawback; Bonds; Foreign Trade Zones; Warehouse Entries; Intellectual Property Rights; and other subjects pertinent to a broker’s duties. 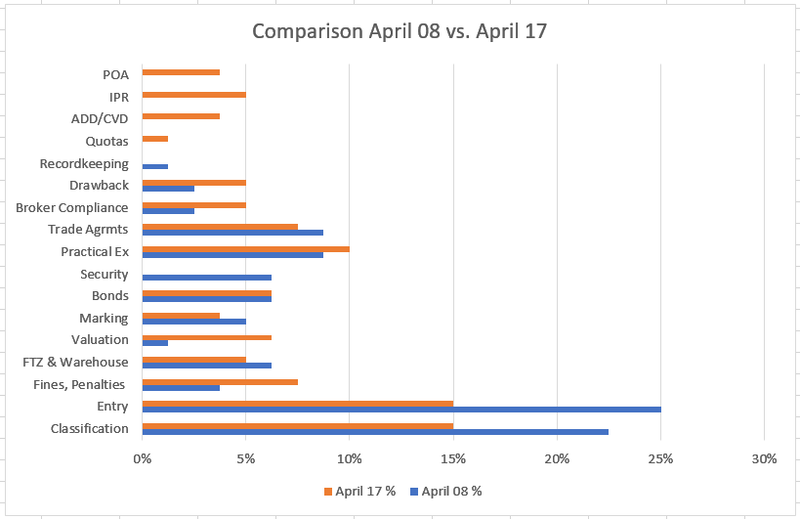 The statistics clearly show that Classification and Entry were the most heavily tested topics comprising nearly half the questions set in the test. 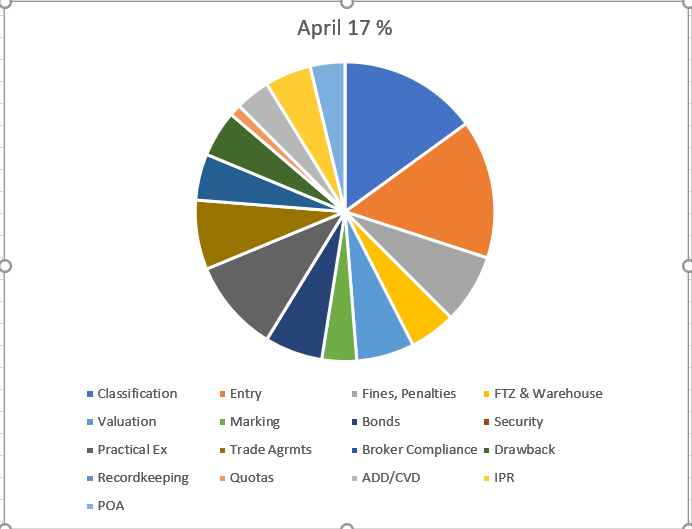 Trade Agreements, Broker Compliance and Valuation topics were the second set of important topics. 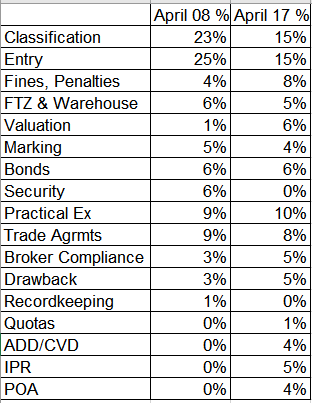 FTZ & Warehousing, Practical Exercises, Fines and Penalties were ranked third in terms of importance. 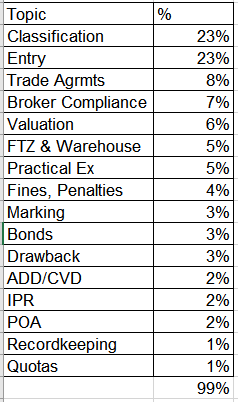 Marking, Bonds and Drawback was the fourth set followed by ADD/CVD, IPR and POA forming the fifth set. Finally, Record keeping and Quotas were the last two minor topics. These 16 topics accounted for 99% of the questions set in the exam. 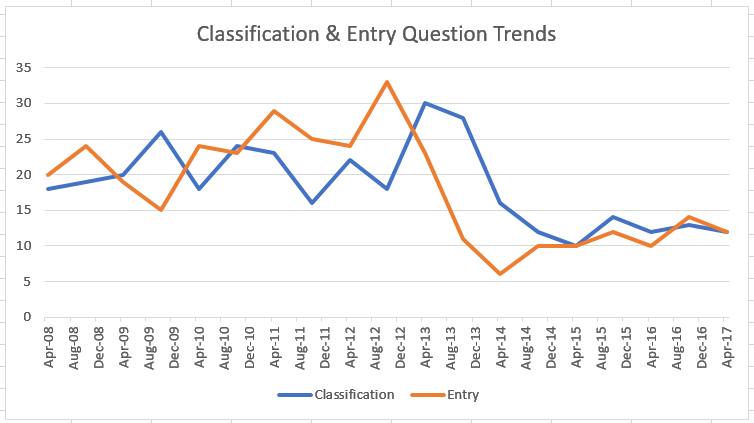 Entry and classification questions are still heavily tested but the emphasis on those topics has reduced slightly to accommodate more topics since 2013. 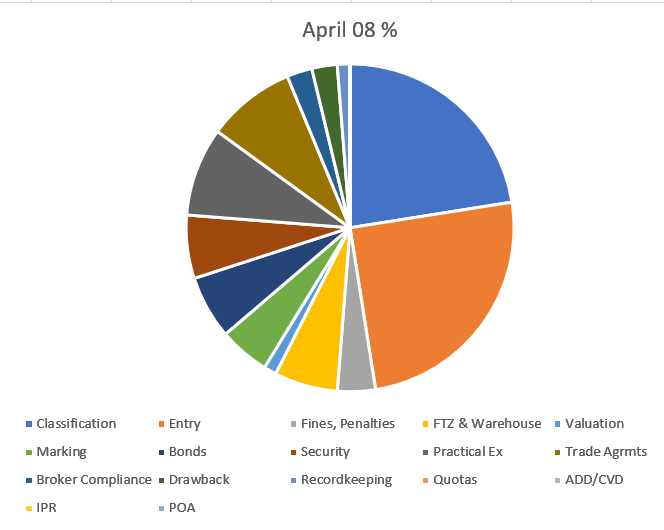 As a result, a few more questions are now included from topics such as Valuation, Anti-dumping/countervailing duty, Fines & Penalties, Intellectual Property Rights and Power of Attorney. For more information about this blog post, please send us a message using our Contact Us form or call (919) 923 4280.